As with any object lesson, this is not a perfect representation of salvation. The idea here is to further a child’s understanding of what Christ does with our hearts when we believe in Him and accept Him as our Savior. Originally written for preschoolers, this lesson can be tailored to any age group depending on your depth of discussion. Who can tell me what sin is? Let the children answer. Sin is anything that we do, or say, or think that goes against what God has told us in the Bible to be truth. It is anything that makes God unhappy. What are some of the things that we do that go against God and make God unhappy? Let the children answer. As they answer, write the sins on the egg with a permanent marker. Write them on top of each other so that the egg starts to look really black. What is this thing we are writing on? It is just a hard-boiled egg. Have you ever touched an egg? How does it feel? What does it look like? Have different children feel the egg as they answer. (possible answers- hard, smooth, maybe a little rough, colored, dark, messy) This egg reminds me of our hearts before we know Jesus. Before we know Jesus our hearts are hard and messy and far from perfect. 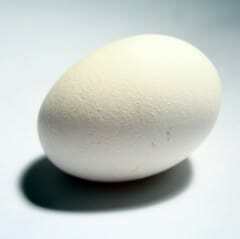 But this egg also reminds me of what Jesus has done for each of us. Jesus was the Son of God and lived a long time ago. Jesus spent His life telling people about God, how much He loved them and how God wanted them to live. But Jesus didn’t just live for us, He also died for us. He died for us because ALL of us have done the things that we wrote on this egg. Name some of the things on the egg. (e.g.- We have all lied, or been unkind, or not obeyed our parents.) What did we call those things? Sin. Our sin keeps us from knowing God and following Jesus. Listen to this promise from the Bible about how God wants to forgive our sins. Start peeling the egg. Jesus died on the cross for our sins. But He didn’t stay dead. After 3 days, He rose again and is now living in heaven. Jesus died on the cross for you and if you believe in Jesus and tell Him you are sorry for your sin, then He can take away your sin just like I am taking off the dark, hard peel of this egg. When you are done peeling the egg, What does it look like and feel like now? Have different children feel the egg as they answer. (possible answers- soft, malleable, no blemishes, clean) That is what happens to our heart when we ask Jesus to forgive us for our sins, the things that make him unhappy. Our heart changes from messy and dark and hard to being clean and soft. ** If the egg doesn’t peel smoothly, it’s okay! Talk about the fact that we do still sin and we aren’t perfect, but we are clean and soft and ready to follow Jesus. Take the opportunity to lead the children in prayer and give them a chance to accept Jesus as their Savior. This is a great idea. I used it tonight at our church’s evening kids club (for unchurched kids). Thank you, this is an incredible way of sharing about sins and our hearts and how Jesus changes us. Excited about sharing this with the children. I am looking for pictures and instructions on how to make a magic wonder bag telling the plan of salvation using the salvation colors. Encouraging illustration. Will use it with my Sunday school lesson. I am looking forward to teaching them about sin on the 10th on September next month coz l have already prepared them a sermon about hope this Sunday, thanks a lot for this coz its going to be an action and interesting teaching. I love it. This is great illustration of salvation. I will use it on our Bible study in order for them to understand easily what salvation is. To God be the Glory. Tony Kummer (Editor) reviewed & updated this page on : March 15, 2019 at 1:21 pm. All our content is peer reviewed by our readers, simply leave a comment on any post suggest an update.